ARISTADA(aripiprazole lauroxil) extended-release injectable suspension is a long-acting atypical antipsychotic that is approved by the U.S. Food and Drug Administration (FDA) for the treatment of schizophrenia in adults. ARISTADA is available in four dose strengths with once-monthly dosing (441 mg, 662 mg, 882 mg), a six-week dosing option (882mg) and a two-month dosing option (1064 mg). ARISTADA INITIO® (aripiprazole lauroxil), in combination with oral aripiprazole, is indicated for the initiation of ARISTADA when used for the treatment of schizophrenia in adults. 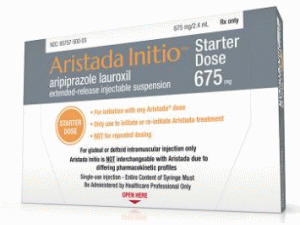 ARISTADA INITIO is an extended-release injectable suspension available in a 675 mg single-dose pre-filled syringe. ARISTADA INITIO is only to be used as a single dose and is not for repeated dosing. ARISTADA and ARISTADA INITIO are not interchangeable due to differing pharmacokinetic profiles. For more information, visit www.aristada.com. ARISTADA INITIO is a prescription medicine given as a one-time injection and is used in combination with oral aripiprazole to start ARISTADA treatment, or re-start ARISTADA treatment after a missed dose, when ARISTADA is used for the treatment of schizophrenia in adults. The most common side effects of ARISTADA INITIO and ARISTADA include restlessness or feeling like you need to move (akathisia). These are not all the possible side effects of ARISTADA INITIO and ARISTADA. You should tell your healthcare provider about any side effects you have. 上一篇：Aristada kit 1064mg/3.9ml(月桂.. 下一篇：ABILIFY MAINTENA 400MG KIT（阿..